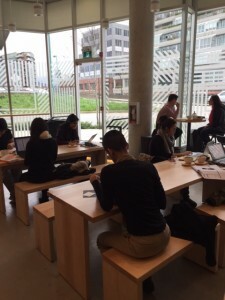 Stylish café that is located close to the Olympic Village skytrain station just South of the Cambie bridge, it’s a fairly large space with high ceilings and wooden sharing tables as well as table tops with high stools. 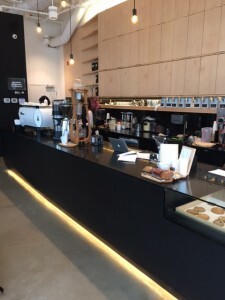 This 30-seat café features coffee beans that are locally roasted by Pallet Coffee Roasters, along with desserts from Cadeaux Bakery along with some cookies and baking done in house. I have visited many times since they opened a couple months ago, most recently visited with my friend Sheryl who just returned from a trip to Italy. 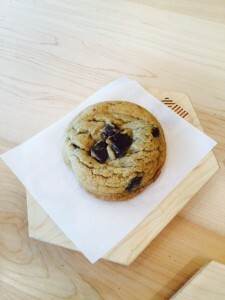 I had my usual Espresso Macchiato, and Sheryl had a Matcha Latte as we shared their delicious just out of the oven Chocolate Chunk Cookie! 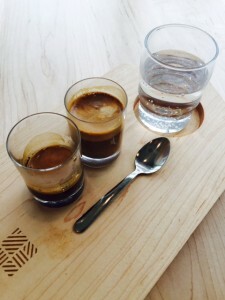 I like how the Espresso Macchiato is perfectly presented with an extra shot of espresso on the side with a glass of sparkling water on their wooden boards. 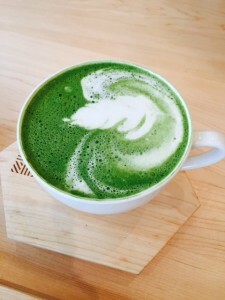 If you are a non-coffee drinker there are plenty of other beverage choices including a selection of teas that include Matcha and London Fog, plus there is a Belgian hot chocolate, iced frappes, and smoothies. In addition to the baked goods you will find a selection of sandwiches and salads to round out the offerings at this cool café.